Where do I use my Tweak Slumber voucher code? Select a Tweak Mattress code at NetVoucherCodes.co.uk. Copy the code and go to tweakmattress.com using our link. Add your mattress to the basket and continue to the checkout. On the ‘customer information’ screen you can enter your discount code in the box on the right of the screen labeled ‘discount’. Apply the code and your order total will be adjusted accordingly. Click 'subscribe & save' in the top right corner on homepage and enter email to receive a voucher code. Sleep is so important, the list of things that lack of sleep can affect your everyday life is huge, so getting a good night’s sleep should definitely be high up on everyone’s priority list. Whilst there are things that we can do to help us get a good night’s sleep, such as keeping the bedroom clutter free, removing gadgets from the bedroom and giving ourselves an appointed bedtime, it really can come down to the mattress for a quality night’s sleep. With a dual comfort mattress you no longer need to compromise on the perfect mattress for you, therefore it can really increase the quality of the sleep you are getting each night. If you and your partner’s ideal mattress would be one-half firm and one-half soft then a Tweak Mattress is perfect for you. You can each sink into the side of the mattress that is perfect for you and enjoy a comfortable night’s sleep. They offer the following combinations; soft & firm, soft & medium and medium & firm. Order online to receive quick delivery within 5-8 days. The 100-night sleep guarantee allows you to sleep on your tailor-made mattress for 100 nights before you commit to keeping it. If for whatever reason you decide that the mattress is not for you, within 100 nights of receipt, then you can arrange to have it picked up and receive a full refund. You can even have the dual comfort layer adjusted free of charge too. So with this in mind, it is definitely a good time to buy a new mattress from Tweak Mattress. How long will I have to wait to sleep on my mattress once it has been delivered? This depends on the type of mattress you have purchased. For the DUO Mattress there is no wait time, you can simply unpack and use straight away. With the Nrem mattress it's best to leave unzipped for 3-4 hours before use. I suffer with back pain can I use Tweak mattresses? Yes! The Nrem is specifically designed to help people that suffer from chronic back pain and is perfectly fine for a partner to sleep on too who may not suffer with any pain. Alternatively choosing the DUO mattress and choosing firm for your side will help you to get a better nights sleep. How deep are the mattresses? Both mattresses are 25cm deep. 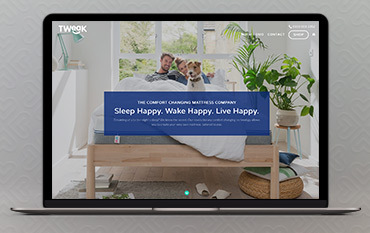 Tweak Mattress have designed a revolutionary mattress aimed at couples. No longer will one of you need to compromise when you both have a different preference when it comes to mattress firmness. The Tweak Mattress allows you to choose a different firmness for each side, so if you prefer a soft mattress and your partner prefers a hard mattress, you can combine the two into your next mattress and both enjoy a good nights sleep. With Free Delivery to your door and a 100-night trial, there seems no better time to order a new mattress, plus if you choose one of the Tweak Mattress discount codes or money-saving offers listed here at NetVoucherCodes, you can get your hands on a brand new mattress for less.